Visible crew/equipment: When Stroker is on his way to the track and is driving the rental car on three wheels, you can see the device under the car that is keeping it from hitting the ground. This occurs right after he knocks down the cones. Other mistake: At the beginning of the film, the car with three wheels enters into the car park of the race track. You can see where the brake disc has gouged out the tarmac on an earlier take. Man in Bar: Come on, damnit, we wanna hear a cluck. 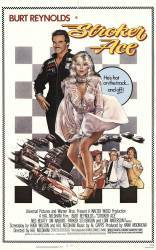 Stroker Ace: Who gives a cluck?